Today we admire the translucent gray-green celadon glaze on Korean ceramics of the Goryeo period as one of the great achievements of world potters. It is startling to realize that once this ware was all but forgotten. In Korea a millennium ago tastes changed. Other styles of ceramics replaced celadon in temples, palaces, and homes of the elite. In the late nineteenth century, long-respected tombs of royal figures and nobility from the Goryeo period (935–1392) became vulnerable to looting. Celadon and other cherished possessions of the deceased, preserved as burial offerings, were plundered and sold in the antiquities market. American doctor and diplomat Horace Newton Allen witnessed this rediscovery while he lived in Seoul from 1884 to 1905, and he formed his own sizeable collection of celadon, it seems, from objects on the open market. Charles Lang Freer purchased Allen’s collection in 1907. 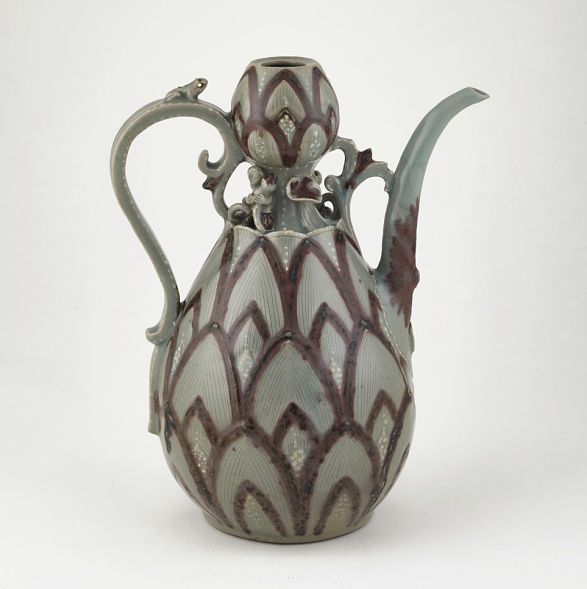 This large acquisition sparked Freer’s deep interest in this distinguished Korean ware. In turn, Allen, Freer, and other early collectors inspired generations of scholars to clarify the styles and dating of Goryeo celadon. Archaeologists have now identified and excavated the kiln complexes at Gangjin and Buan, which produced the finest celadon wares during the Goryeo dynasty.